These days spectacle frames are as at home on the catwalk as any supermodel might be. Many well known designers of haute-couture have diversified into spectacle frame design. D & J Brower Opticians have stocked Calvin Klein frames for a number of years and are very popular with the fashion conscious patient. Each frame in the range has a distinctive look which is at the highest pinnacle of spectacle design, has the personal approval of Calvin himself and come with a one year guarantee. Now into the spectacle frame arena comes Nike, the second most well-known brand name. Made by Flexon in the metal material with a memory that is almost impossible to break, in an exquisite range of styles and designs. 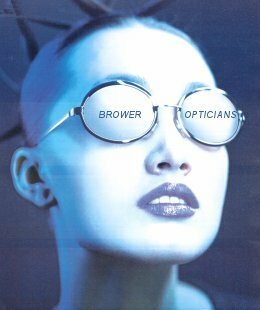 D & J Brower Opticians supply spectacles at very competitive prices due to the lower overheads than the high street shops. They also run various promotions from a number of companies throughout the year which unlike a sale can offer genuine reductions on current items. The choice of spectacle frame will also be influenced by the type of spectacle lens you require and this is where the professional skills of registered Dispensing Optician, Jennifer Brower, will help. She is trained and experienced to help you select the most attractive and comfortable frames that best suits your face and your personality and ensure that they are going to fit comfortably. Please feel free to pop into the practice to browse through the extensive range of Vogue spectacle frames. Remember it pays to browse at Brower's. How do you decide which frame style, shape material and colour suits you best? We will help you, of course. According to one large UK optical supplier metal frames are chosen by 63% of people, plastic frames are preferred by 17% and rimless or semi-rimless chosen by 17%. WE'LL FIND THE RIGHT FRAME FOR YOU! Your glasses are an integral part of you and your personality. So choosing the right frame is very important. Not only do you want to look good, you want to feel good too. The right frame can enhance your best features and the best way to find out how to do this is to obtain expert advice from Mrs Brower, the dispensing optician at D & J Brower Opticians. Fashion styles seen on the catwalk but not on the streets. The shape of your face is an important consideration when choosing spectacle frames, as each shape, whether it be round, square, oval or irregular, suits certain frame shapes and styles. A knowledge of frame shapes can help to minimalise the appearance of some unwanted facial characteristics such as a plump face or long nose. Heart shaped faces appear better in shallow oval frames. Someone with close set eyes should choose a frame with a clear bridge and an extended decorative outer (temporal) area. A round face requires the opposite to that above to minimize facial width. A patient with a square face, a wide chin and angular jaw, will need a frame that makes the face appear shorter such as a frame that is wider than the face. The spectacle frame colour is also important. Gold has a generally warm appearance although silver sometimes tones in with silvery hair. With the greater variety of colouring available today, frames in grey, black or gun-metal colour, will often look better on people with black or grey hair. For pale complexions, lightweight metal frames and those with a hint of colour are usually preferred. Dark complexions look better with gold, silver or clear spectacle frames. If you have an allergy to some frame materials such as nickel or cellulose acetate choose titanium, stainless steel or special inert plastics materials such as Optyl or SPX.